The sleeping dragon has officially been roused. The widely utilized DirectX game and multimedia APIs are receiving a generational update for the first time in a whopping five years, Microsoft recently revealed on its developer blog. Perhaps not-so-coincidentally, the announcement comes just a few short weeks after the launch of AMD's much-ballyhooed Mantle API. 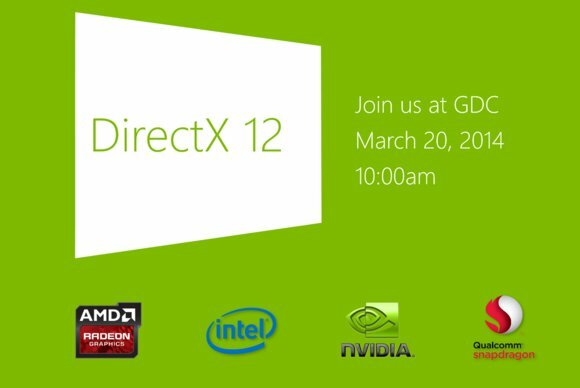 We'll get our first real glimpse of DirectX 12 on March 20, when Windows graphics development manager Anuj Gosalia gives a talk at the Game Developers Conference in San Francisco entitled "DirectX: Evolving Microsoft's Graphics Platform." Windows graphics development lead Max McMullen will also hold a talk dubbed "DirectX Direct3D futures" on the same day. All we know about DX12 so far is gleaned from the description of Gosalia's talk. "For nearly 20 years, DirectX has been the platform used by game developers to create the fastest, most visually impressive games on the planet. However, you asked us to do more. You asked us to bring you even closer to the metal and to do so on an unparalleled assortment of hardware. You also asked us for better tools so that you can squeeze every last drop of performance out of your PC, tablet, phone and console." So can we expect performance increases? Almost certainly—the Direct3D talk promises a Mantle-esque "unprecedented level of hardware control and reduced CPU rendering overhead." Can we expect DirectX 12 to improve cross-platform compatibility, in keeping with Microsoft's PC/phone/tablet focus? Definitely—note all the mobile talk in the description and the Qualcomm Snapdragon logo in the graphic above. Can we expect to see a lot of chartreuse? Count on it. In all seriousness, details are short at the moment. Since DirectX 11.1 came with Windows 8 and DirectX 11.2 requires Windows 8.1, it wouldn't be surprising to see DirectX 12 tied to the next big Windows release. Could the big Windows "Threshold" update rumored for spring 2015 be DirectX 12's launch party? The changes in that build are reportedly massive enough to possibly warrant a full-blown "Windows 9" name rather than Windows 8.2, which would make the introduction to a whole new generation of DirectX similarly appropriate. 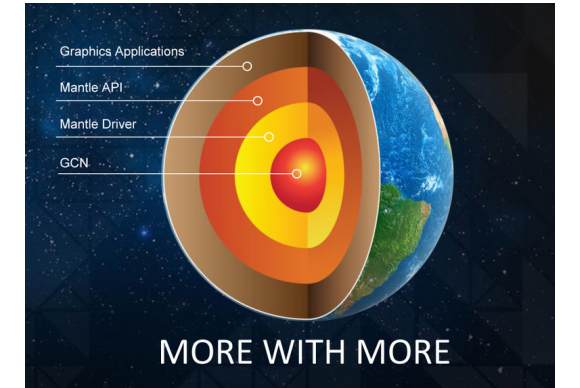 A graphic illustrating AMD's Mantle tech at a high level. We're also curious to see what sorts of improvements Microsoft offers in an increasingly competitive market, what with Valve pushing OpenGL with SteamOS and AMD actively advocating its Mantle technology. 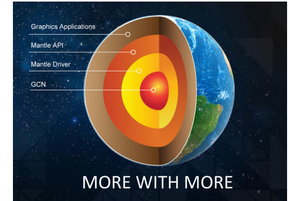 Mantle gives developers more direct access to AMD hardware—and hence improved, yet highly variable performance—than high-level tools like DirectX and OpenGL, which were designed to support hardware of all makes and models. AMD's promotion of Mantle and open questioning of whether or not Microsoft even cared to update DirectX likely goaded Microsoft into its "closer to the metal" comment in the DX12 teaser. "Yesterday several articles were published that reported that DirectX and OpenGL are being extended to include closer-to-metal functionality and reduced CPU overhead. AMD supports and celebrates a direction for game development that is aligned with AMD’s vision of lower-level, ‘closer to the metal’ graphics APIs for PC gaming. While industry experts expect this to take some time, developers can immediately leverage efficient API design using Mantle, and AMD is very excited to share the future of our own API with developers at this year’s Game Developers Conference." We'll be on-site at GDC though to bring you details as soon as they're revealed, so make sure to save the date.